& others. 2 CDs. 1:17 hrs. Dreamscape Audio. Mar. 2018. $12.99. ISBN 9781974900060. 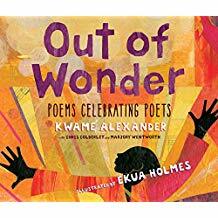 Gr 4–7—Poets Chris Colderley and Marjory Wentworth join Alexander in honoring writers, from Rumi and Basho to Terrance Hayes. Emily Dickinson is added to a rich, diverse mix of 20th- and 21st-centory authors that includes Maya Angelou, Billy Collins, Naomi Shihab Nye, William Carlos Williams, Mary Oliver, and Pablo Neruda. Each original entry reflects the work of the poet who inspired it. Divided into three sections: "Get Style," "In Your Shoes," and "Thank You," the poems are enhanced with simple, compatible musical backdrops. The recording concludes with short, insightful biographies and a list for each poet's country of origin. Ron Butler, MacLeod Andrews, and Erin Bennett narrate with a careful, light-handed touch. While both CDs contain the entire text, one adds page-turn tones. Equally appropriate for primary and middle school learning, this is a perfect springboard for lessons in literature, geography, art and a wide variety of creative explorations. VERDICT With a multitude of potential uses, this delightful audiobook is a valuable addition for all libraries serving elementary and middle school students. Adults and teens will find it appealing, too.